The sauna parts you choose to install can go far to enhance your experience. Items that can be considered part of your supply include: doors, benches, headrests, backrests, heater guard rail, towel racks, volcanic rocks, clocks, controllers, thermometer, hygrometer, vapor-proof light fixtures, cedar grilles, cedar register vents, and floor mats. The sauna door should be narrow, about 24” ideally, and have a glass window. A sauna door must open outward, and should never lock. 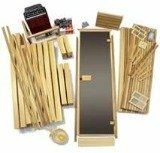 As with most wooden sauna parts, the sauna door must be made of soft wood that can withstand the heat of the sauna without retaining heat on the surface area. Sauna benches are usually built with an air space of one half inch between the bench’s cedar planks to permit air to circulate. Benches are normally about 20" wide so you can be comfortable sitting or lying down. Must-have sauna parts include a remote control panel mounted outside the sauna to switch the heater and lights on and off, adjust the temperature, and give a digital read-out of temperature and time remaining. A wall-mounted clock, located outside the sauna where you can see it through the glass door, is inexpensive and ideal for timing your sauna sessions. 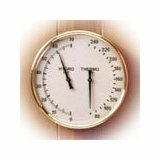 A vital part on your sauna’s equipment supply list is the thermometer. The thermometer is hung about 6" below the ceiling and directly above the heater. Another important part is the hygrometer to keep track of the humidity level inside the sauna. You’ll want the humidity to range between 10 to 35%. If it is higher than that, you’ll know the rocks are not hot enough and are producing too much steam when water is added. The sauna rocks, which rest on top of the stove in a tray, are vital sauna parts. They must withstand the constant pressure of heating and cooling, as they will heat up to a range of about 950 to 1500 degrees and then have water applied to them. But not all sauna rocks are equal. 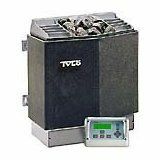 Since they are an integral part of your sauna equipment supply, you’ll want to get the best, which generally speaking, means volcanic rocks. They should be the size of oranges or large potatoes, and should be an igneous rock such as peridotite, olivine or vulcanite. You’ll get a supply of rocks along with the other parts of your sauna kit or heater but you’ll need to replace them eventually since even the best will crack and crumble. If you do have to buy new rocks for your Finnish sauna heater, be sure to wash them first to remove any dust or dirt. Sauna flooring should be on your parts list. It is supplied in 1/2" or 5/16" thick injection molded plastic mats and is ideal for pools, spas and saunas. It’s a cushioned, non-slip and sanitary surface, easy to clean, and contains an antimicrobial to fight molds and mildew. 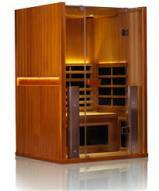 Another item for your sauna supply and parts list is to investigate the sauna cleaners on the market which help keep the wood in your sauna scum-free and prevent discoloration. Proper maintenance of your sauna during and after use is important. The intense experience of a sauna is a good daily stress-buster and if you can hit the sweat lodge a few times a week you’ll see the results in your weight control and over-all well-being. 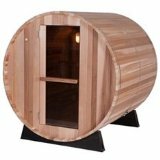 The purchase of the proper sauna parts will help you fully appreciate the many health benefits of this ancient pastime.